The Arctic is the northernmost region of the Earth, surrounding the North Pole. 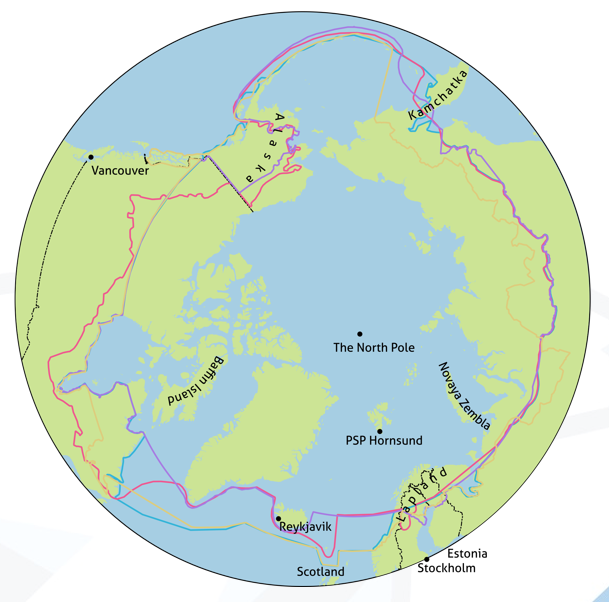 Its surface area is around 45 million square kilometers, 1/3 of which consists of the Arctic Ocean and surrounding seas. In this area only ca. 4 million people live, which makes the Arctic one of the most sparsely populated area of the Earth. Circa 10% of this number are indigenous peoples – nations, who have lived in the Arctic since long before Europeans arrived in the region. As the region is so vast and diverse it is hard to designate unambiguous borders to define it. Therefore, there are many different definitions being used to designate the Arctic region. It is possible to follow purely natural criteria, the northern polar circle or the northern treeline can be used as borders. Such delimitations omit many places, which should be considered as a part of the Arctic region culturally, climatically or in terms of landscape. Therefore, several international organizations and committees have different definitions which include various regions of the northern areas of our planet into the Arctic depending on various cultural and/or environmental criteria. There are 8 countries, whose parts lie in the Arctic: Norway, Sweden, Finland, Denmark, Canada, USA, Russia and Iceland. Iceland is by most recognized definitions the only state to lie completely in the Arctic, all the other have only parts or regions there. However, if we assume the polar circle or the northern treeline as the only criteria, Iceland would not be defined as a part of the Arctic. Living conditions in the Arctic are very diverse. There are not many cities in the Arctic and they are often far away from each other as in e.g. in Siberia in Russia, Alaska in the USA and in Canada. The cities in the arctic are similar to cities in other parts of the world, examples of cities are Murmansk in Russia, Reykjavík in Iceland and Tromsø in Norway. Many people live in small towns or settlements spread across vast reaches of Siberia, Alaska, Canada, Greenland and Scandinavia. In the farthest north, in Spitsbergen and the Canadian Archipelago, scientific stations were established, whose function is research and support for scientists. All of these communities, regardless of size, share similar concerns of isolation, harsh climate conditions and polar day and night often disturbing sleep patterns of inhabitants.